CNic Paleo ArtNouveau provides excellent facilities and services to accommodate its guests. 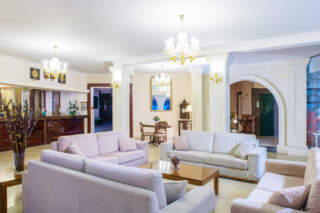 It has a spacious lobby where guests can relax and read the newspaper accompanied by a soft selection of music, Bar and coffee shop, Reception with multilingual staff, large size swimming pool with separate childrens pool with sun loungers and parasols by the pool, Pool Bar with a variety of snacks and sandwiches, mini market, jewellery shop and outdoor private parking. In addition to the outdoor swimming pools, Cnic Paleo ArtNouveau features a roof bar, restaurant, poolside bars and bar/lounge.